I don't know about you, but my Sunday evenings recently have been taken over by the ITV series of Victoria and I have loved tuning in every week to see how the young Alexandrina transforms from stroppy teenager to Queen Victoria - with the help of her Prime Minister 'Lord M' - Rufus Sewell swoon!! - and also the love of Albert, who she didn't even like after their first meetings! So when I heard about this book I knew it was going to be the perfect read for me and it was! 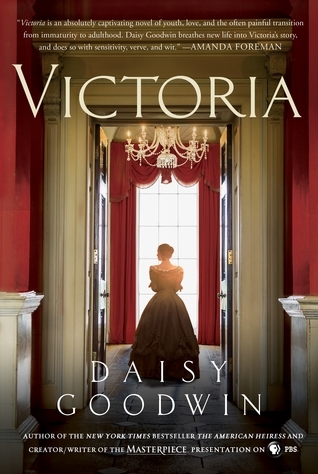 Daisy Goodwin wrote the TV series and so, this book is the TV show in book form! It tells Victorias' story up until the proposal from Albert, so we get to see the struggles she has dealing with her new lifestyle, issues with her family and how the people of Britain take to having such a young Queen. It is fascinating historical glimpse into life at the time with lots of lovely history nuggets to enjoy, as well as a more personal story of a young girl becoming a young woman in the public eye. I found this to be such a fun, easy and interesting read and the perfect antidote to not having the TV show on anymore, and I am really looking forward to the series continuing in book and tv form in the future as we follow her fascinating life story. Highly recommended for all who love a good history and romance story!